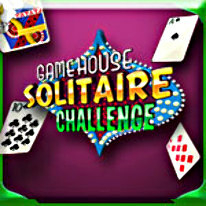 Take a break today with Solitaire Challenge, a fantastic collection of solitaire games featuring an original twist! Choose from ten of your favorite solitaire variations including Klondike, Tri-Peaks, Pyramid, Spider and more! Play a relaxing game of card-matching, or try the all-new Challenge mode that puts a brain-bending spin on classic fun! Use the Online Global Statistics Ticker to compare your solitaire stats, including longest win-streak, winning percentage and more, with Solitaire Challenge players all over the world. Whether you're looking to relax with a soothing game of cards, face a perplexing challenge, or go for global bragging rights, Solitaire Challenge is a unique take on classic family fun!